Few topics are more relevant to women than dealing with our emotions. In her latest book, Unglued: Making Wise Choices in the Midst of Raw Emotions, Lysa TerKeurst seeks to help women respond with self-control to those unexpected moments of stress or conflict in which we feel overwhelmed and respond in ways we later regret. Ranked #9 in Christian Living and #1 in Theology on Amazon.com at time of review, this book strikes a powerful chord with women. National speaker and New York Times bestselling author of 14 books, Lysa aims to help women make what she calls “imperfect progress”—to take simple steps toward change (11). She encourages us to follow her in rejecting “labels from the past” that define us and keep us from moving forward. We begin by identifying and understanding our reactions—according to her we are “exploders” or “stuffers” or both, depending on the situation—and then developing a plan to handle more skillfully our emotions when situations threaten to overwhelm us (59, 81). As I read Unglued, I could see why Lysa is such a popular author for women—she writes in a chatty, “girls night out” style that makes you feel like she is your best friend. Personal stories appear with refreshing regularity throughout the book. And every woman alive can relate to Lysa’s everyday struggles and stresses. She is genuinely humble and seems to have a sincere desire to grow in godliness and to help other women do the same. Her suggestions for change are practical without becoming prescriptive. It’s possible to come away from this book seeing your need to make changes in your life and being motivated to do so. However, I have significant concerns about this book—chief among them, the absence of the gospel. First, there is an inadequate understanding of God’s character, in particular his holiness. God is not clearly presented as the holy judge of the universe who demands perfection (not “imperfect progress”) and who justly pours out his wrath on sinners. While Scripture is employed, its exegesis is frequently inadequate or flawed, and God feels more like a minor character in the drama of human relationships and feelings, and his Word like a self-help manual. So when Lysa gets angry at an airline employee, responds harshly to a friend, or is impatient with her children, she is primarily distressed over damaged relationships or her own feelings of failure and regret rather than her sin against a holy God. Thus, Unglued is more self-referential than God-centered, making its counsel inevitably flawed. The book’s deficient view of sin flows from an inadequate understanding of God’s character. “Unglued” is the first of many euphemisms for what the Bible calls sin. While biblical language is employed at times, its definitions are inadequate, and the repeated use of cute and sometimes clever descriptions of our negative emotions enhance their vividness but obscure their seriousness. Judgmental and self-pitying thoughts are relabeled “negative inside chatter,” while the jealous woman is recast as “the empty woman” (131, 141). Lysa’s categories of “exploders” and “stuffers” help me think about how I tend to react, but not about the seriousness of the anger, bitterness, or pride that fuels these reactions. And again, the accent is often on how these emotions are difficult for the one who is emotional—not first and foremost on their sin against God and others. Zondervan (2012). 208 pp. $9.99. God gave us emotions to experience life, not destroy it! Lysa TerKeurst admits that she, like most women, has had experiences where others bump into her happy and she comes emotionally unglued. We stuff, we explode, or we react somewhere in between. What do we do with these raw emotions? Is it really possible to make emotions work for us instead of against us? Yes, and in her usual inspiring and practical way, Lysa will show you how. 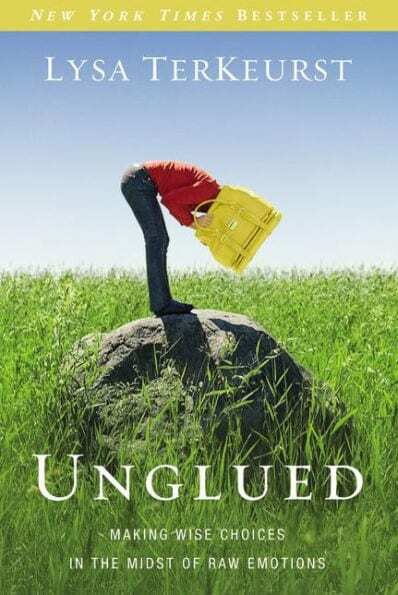 Filled with gut-honest personal examples and biblical teaching, Unglued will equip you. While Lysa sees our inability to handle our emotions as a big problem for women, she actually misses the magnitude of it all. Our negative emotions (such as anger, anxiety, bitterness, resentment) arise from our evil desires (Jas. 1:13–15) and, when indulged, result in acts of rebellion against the holy and righteous judge who must unleash his wrath on sin. Here is the truth about my emotions according to Scripture: I am more than unglued. I am unable. And I am sinful. I don’t simply need a preemptive plan or a few carefully crafted questions—I need someone to rescue me; I need someone to save me; I need someone to cleanse me; I need someone to forgive me. I need a Savior. Sadly, because Lysa does not “deliver as of first importance” our need for a Savior (1 Cor. 15:3), she does not lead us to the only place where we can find true help for our unruly emotions: the cross of Jesus Christ. At the cross we see our greatest problem—our sin deserving of God’s holy punishment—but there we also see our greatest problem solved. Because and only because of Christ’s substitutionary death and subsequent resurrection we can come before a righteous God and receive forgiveness for our sin and the power of the Holy Spirit to change—all for the praise of his glory. Only a right understanding of the gospel will enable us to deal with “raw emotions.” At the cross we find grace to repent, not simply rethink. At the cross we experience God’s power to put to death selfishness and pride, envy, and malice. At the cross we receive a new heart with new desires to please and glorify God. At the cross we find a “way of escape” when we are tempted (1 Cor. 10:13). We can make progress in sanctification, to be sure, but only by way of the cross. I also fear that Unglued may unintentionally reinforce a false assurance in non-Christian readers, leading them to think that because they can quote Scripture and take steps to manage their emotions they have experienced authentic gospel transformation. But self-generated self-control doesn’t make sinners right with God. Neither, I fear, is Unglued a reliable guide for Christians seeking to grow in maturity. Christians need, first and foremost, to know our Savior, and true change flows out of a relationship with him. Without the cross as the reference point, we have no hope for lasting, genuine change. Nicole Whitacre is a wife and mother of four. She lives with her family in Louisville, Kentucky, where they are members of Sovereign Grace Church of Louisville and her husband, Steve, is a student at The Southern Baptist Theological Seminary. Nicole is the co-author of Girl Talk (Crossway, 2005) and Shopping for Time (Crossway, 2007) and blogs with her mom and sisters at www.girltalkhome.com.